t*rexes and tiaras: Sewing for Pleasure.. Despite thinking that the weekend was going to be too full for me to find time to breathe, it actually turned out to be quite a productive one. In between running errands and attending Little Sis' birthday party on Saturday, I managed finally to turn another of my fabrics into a dress. 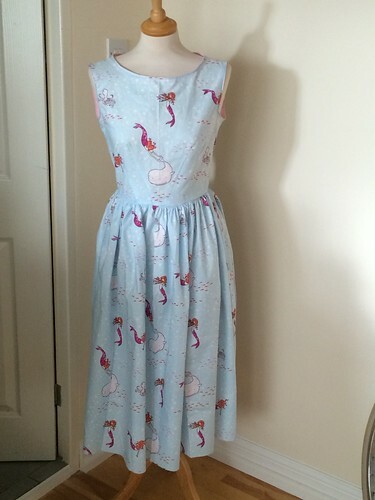 I'd ordered this Sarah Jane mermaid print (the range is called Time for Play) from Brighton Sewing Centre, about a year ago, as I'd been struggling to find enough of it left anywhere else and was desperate to turn it into a dress. So desperate, indeed, that it's been sat in the fabric trolley ever since. I've been telling myself for a while that I really CANNOT justify any more fabric purchases until I've used up what I have. (I did make an exception to this rule for the Mad Men challenge, as I didn't have enough of anything for the pattern I'd wanted to make). However, productivity levels hadn't been that great last week and I'd only gotten as far as pinning out my pattern. Thankfully, I managed to get it put together in my spare couple of hours on Saturday. OK, so I haven't exactly used up a lot of my stash, but it was one step closer, I suppose. A good thing, too, as Sarah and I went to the NEC on Sunday for the Sewing For Pleasure Show, where I was sure there would be plenty of fabric bargains to be had. There was quite a lot to see, with various demonstrations running throughout the day. 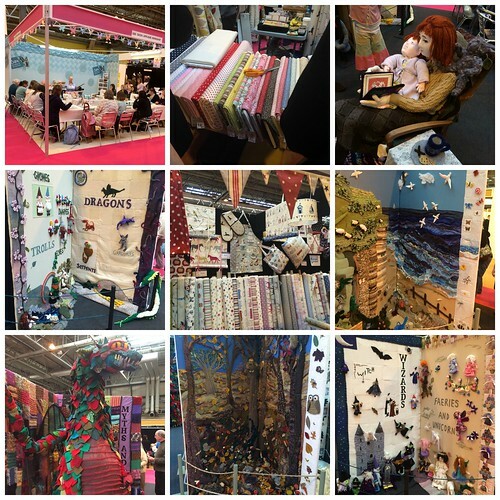 We didn't stay for those, but went to look at the giant fabric books, which were quite impressive. We had a good wander around the stalls themselves and I managed to talk myself out of buying an overlocker, for the time being anyway. Although there were quite a lot of stalls, I'm not sure that any of the fabric I was interested in was actually any cheaper than you can find it online - in fact, some of it was a LOT more pricey. That said, I did come home with three new fabrics, because I couldn't resist their prints. 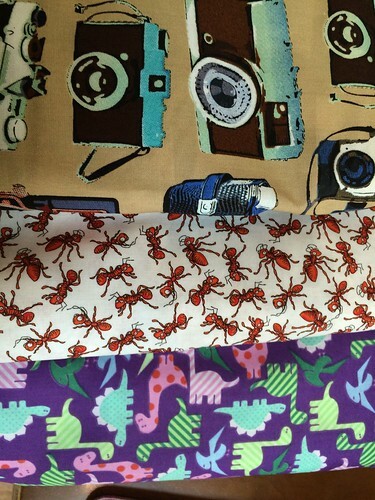 The camera and the ant print fabrics were £7/m and the dinosaurs, which I already had in black from the last fabric shopping trip, was £8/m (although that's a 60in roll, so I still think that's really good!). I came home feeling inspired and decided that I would get on with the next dress I'd decided to make anyway, which was my original dinosaur fabric. I'd managed to pick up some blue bias binding in the hope that I could match it to the print and make contrasting neckline and armholes. I rather like how it turned out, although I'd use wider bias binding in future, and would maybe edge the hem as well. I was rather pleased as this one only took me a few hours on Sunday evening, despite having a little mental block about which order I needed to attach things for the gathered skirt to work with the pockets and the waist tie. That's what happens when you decided to work without a pattern, I suppose. I'm pleased to mention that these are dresses 12 and 13 of the year, which I suppose means that I've already reached my target of one item per month, pro rata. That said, I'm still really enjoying my dressmaking, so long may it continue. 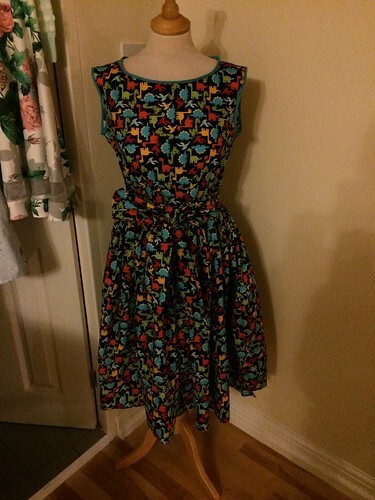 You amaze me how you can just make a dress so quickly and it is lovely too. I really must have a go at making one. I keep saying but never do! I'm really wanting to try some new patterns, it's only because I've made this pattern up so many times that I know how it goes together and can do it a little quicker. I need a new challenge, thought. ooh I didn't know there was another colour way for that dinosaur fabric. And I absolutely LOVE the camera fabric. I've been looking for camera prints for a while, what make is yours if you don't mind me asking? Your new dino dress looks great. The bias binding is a cute finish. I'm not sure but will have a look on the selvage and get back to you..
Oh, that looks like a fab book. Yes, it's rather similar isn't it? I'd love to see your dress once you've made it. Gosh, you're so talented! I can't even work a sewing machine. I really like the fabric used in both dresses and the second has such a lovely shape. Your sister is one lucky girl! Wow, I just love the gorgeous creations which seem to fly out from under your needle, you are so talented!